Comfy Joey is proud to present its Linen Sling Collection. These luxurious ring slings are made in the USA with the versatile CJ Hybrid Shoulder, which allows wearers to spread the sling fabric wide to hug the shoulder, virtually eliminating pressure points, or gather the shoulder fabric narrowly, maximizing freedom of movement for the ring-side arm with very little bulk. We have tested the CJ Hybrid Shoulder with wearers of different builds, and we think you will love it. By nature, Comfy Joey Linen fabrics will display the color variations, loose threads, and tiny slubs and snags characteristic of natural fibers. These variations should in no way be considered flaws or defects, as they serve to enhance the fabrics unique beauty. 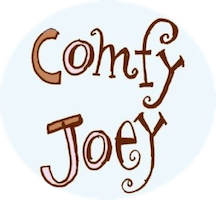 The Comfy Joey Sizing Table applies to our pouches, for which a perfect fit is critical to comfort and safety. For ring slings, which are designed to be adjustable, size is essentially a matter of how how long you prefer your sling tail. Our model is wearing a sling that corresponds to her size from the Comfy Joey Sizing Table.